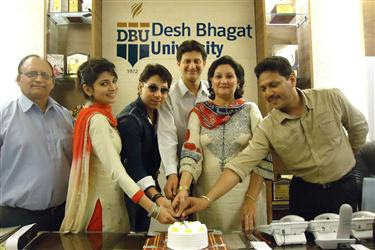 Media Department of Desh Bhagat University & Desh Bhagat Radio 107.8 FM (Aap ki Aawaaz) celebrated ‘Chandigarh Bollywood Day’ with a cake cutting ceremony. Special guests on this occasion were from Punjabi film industry including Actress Sumandeep, Actor & Singer Garry Waraich and Actor, Producer & Director Jasbir Dhillon who appreciated the initiative taken by the university. Vice President Desh Bhagat United and Director Desh Bhagat Radio Er. Sandeep Singh welcomed all the guests. Mrs Tainder Kaur Pro Chancellor Desh Bhagat University, Vice Chairperson Desh Bhagat United & Desh Bhagat Radio said that this is the third year in a row that the university is celebrating this particular day. It's worth mentioning that 3rd April is an important day as on this day, Big Stars of Indian Film Industry Amitabh Bachan, Shahrukh Khan, Rani Mukerji, Preeti Zinta, Hema Malini & famous film Director Late. Sh. Yash Chopra Ji along with a Big Unit of 200 persons were under one roof in Hotel Mountview for the shooting of a super hit film ‘Veerzara’. Darshan Aulakh’s production arranged the shooting at Chandigarh and around the city. The part of the above big cast was National Award winner child artist in the field of Acting, Pragati Trikha. Hence this day signifies the importance of city beautiful in Bollywood.